Skinny French Onion Dip is so creamy and full of fresh flavor that you’ll never miss the extra calories! This post is sponsored by Milk Means More and the United Dairy Industry of Michigan. All opinions are my own. Now that fall is in full swing, soccer isn’t the only sport occupying our time. After games and practices all week and Saturday double headers, soccer gives way to football on Saturday afternoons. Well, in Bacon Slayers world anyway. He’s got this thing going on with the DVR where he records whatever football game is the current favorite to watch after we’re home from soccer. He gets downright giddy when he can buzz through all of the commercials to bring “football time” closer to real time. One thing that Bacon Slayer doesn’t find so humorous is spoilers when he’s watching a game on t.v. He starts throwing serious shade if anyone is on an internet capable device when he watches a game. He’s even gone so far as to insist on “internet blackouts” because he doesn’t trust any of us not to spoil his viewing experience with comments about the game that may have been gleaned from social media. Seeing as these lazy football afternoons feel like the only time that I sit down all week, I join Son #1 in parking my phone in another room to keep his daddy happy. Then we all hang out while feigning at least half as much enthusiasm as Bacon Slayer holds for the game. I’d say Bacon Slayer was being extreme with the blackouts thing if maybe Son #1 and I hadn’t accidentally spilled to beans on the results of a given game a time or five. Obviously my eldest and I don’t take football as seriously as we take soccer–much to my husband’s dismay! When halftime rolls around on our tape-delayed football fest, we’ve likely been going strong for a good 8 hours or so since breakfast. The munchies hit with authority! Something about watching football seems to rouse the need to forage for snacks. And by forage, I mean we run to the kitchen to grab a few bags of cut vegetables and pretzel crisps to dump around a heaping bowl of Skinny French Onion Dip. Skinny French Onion Dip is made from scratch by folding seasoned, caramelized onions into Greek yogurt. 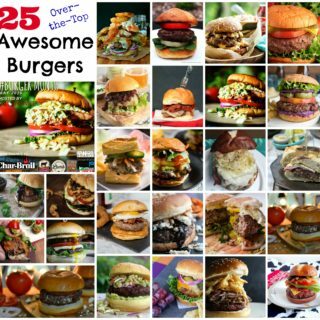 The recipe comes together in all of 25 minutes. This dip that gets better mellowing in the fridge and giving the flavors time to mingle. I like it because it’s thick and creamy, but not cloying or heavy on the tongue like the store bought tub varieties. 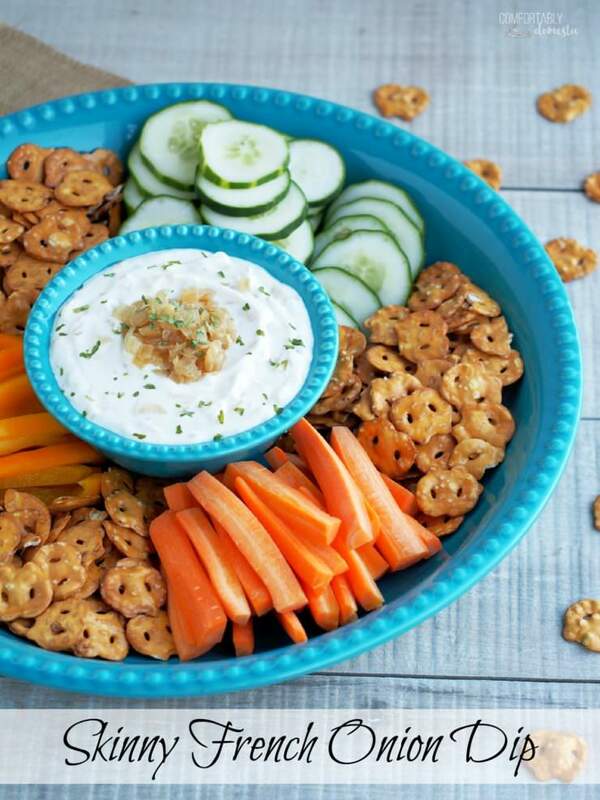 The yogurt cuts enough calories to make this onion dip a guilt free indulgence. Don’t worry! Skinny French Onion Dip is so creamy and full of fresh flavor that you’ll never miss the extra calories! Print the Skinny French Onion Dip recipe! 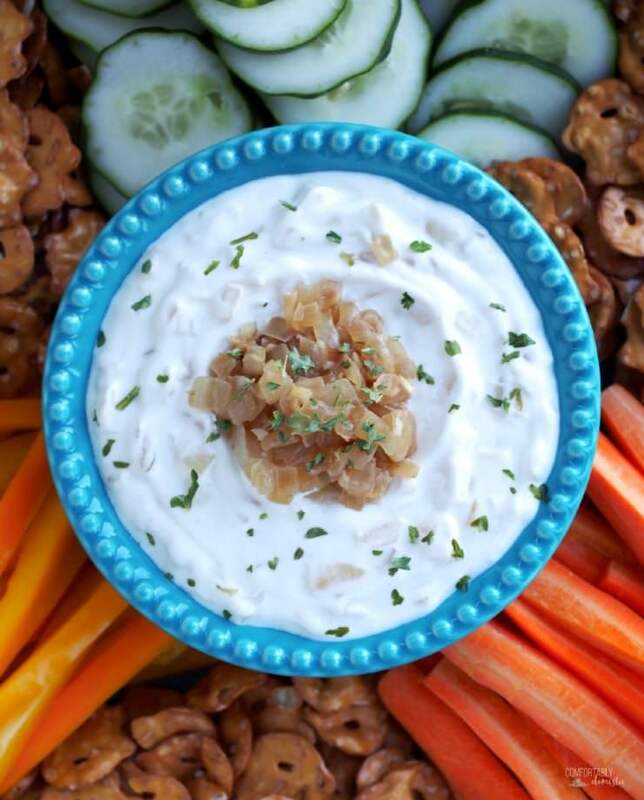 Skinny French Onion Dip made with yogurt is so creamy and full of fresh flavor that you’ll never miss the extra calories! Melt the butter in a skillet set over medium heat. Place the diced onions into the melted butter, stirring to coat. Cook the onions for 10 minutes, stirring frequently, until onions soften and begin to look translucent in appearance. Reduce the heat to medium-low. Add the garlic to the onions and season with salt and white pepper. Continue to cook and stir the onions until they begin to take on a pale yellow “caramelized” hue; about 5 minutes more. Stir in the reduced sodium soy sauce to coat all of the caramelized onions. Cook for a few more seconds or until all of the soy sauce is entirely absorbed by the onions. The onions should have reduced to about 1 cup in volume. Transfer the onions to a glass or ceramic bowl to cool until just slightly warm. Once cooled, fold ¾ of a cup of the caramelized onions into the plain Greek yogurt until combined. Reserve the remaining caramelized onions for serving. Cover the bowl of dip with plastic wrap and refrigerate until chilled through; about 1 hour. Once chilled, transfer the dip to a serving bowl and garnish with reserved caramelized onions. 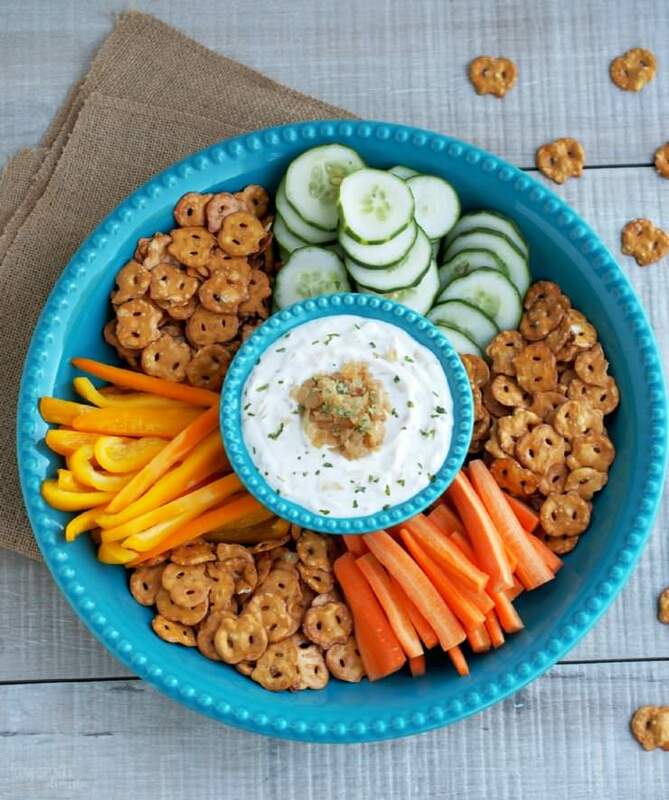 Serve Skinny French Onion Dip with freshly cut vegetables, pretzel crisps, bread sticks, pita chips, or potato chips. 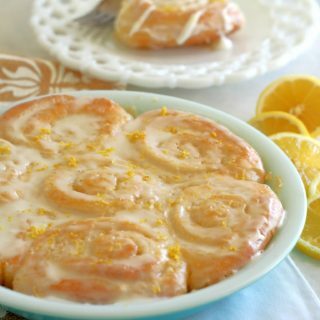 Try these other skinny dips at your next party! My Skinny Hummus is delicious! 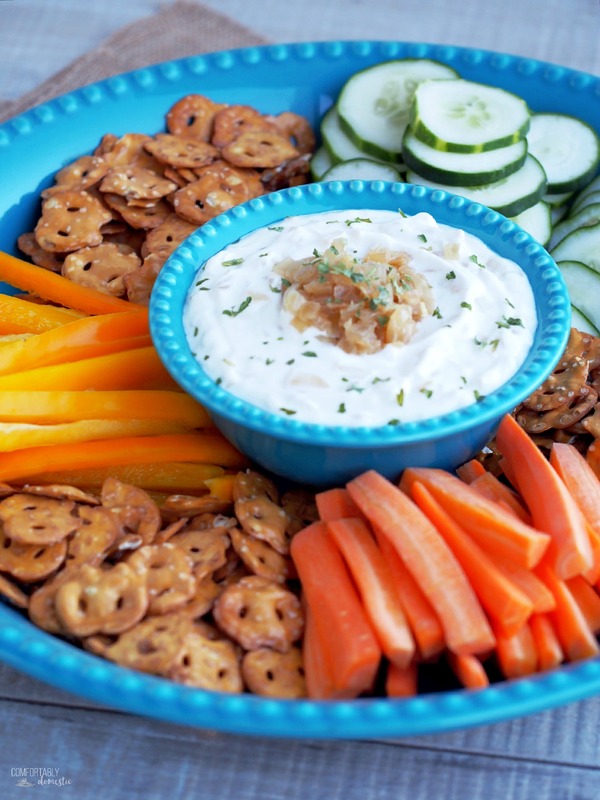 French onion dip is one of my favorites! I need to try this ASAP! Thanks for sharing my corn dip! You betcha! That corn dip looks delicious! Seriously, every time your refer to bacon slayer I picture Buffy the Vampire Slayer fighting a piece of bacon, stapled to Spike's head. I can't help myself. I have all these weird visuals when I hear the term. And it makes me giggle uncontrollably. Ha. I love this dip. I could eat this all day long. No joke. I could eat this for breakfast, lunch, and dinner. French onion dip is my weakness and I love that you made a skinny version... now I can eat more!